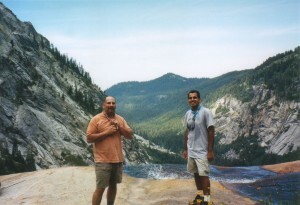 Do you enjoy hiking in the Sequoia Forest? Do you want to see magnificent, pristine mountain scenery? How about having all your meals cooked for you, and not have to clean up afterwards? 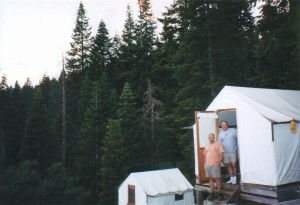 Well, Bearpaw Meadows High Sierra Camp in the Sequoia National Park is just the place for you. It has all of those things and more. Bearpaw Meadows Camp is a 11.3-mile hike one-way along the High Sierra Trail heading out of the Giant Forest area of Sequoia National Park. The trail head starts in Crescent Meadows, which is approximately 10 miles south of Wuksachi Lodge. There is a parking lot there to leave you car while you are hiking into the wilderness. Don’t forget to get a wilderness pass at the ranger station before you head out. The Lodgepole visitor center has a ranger’s office that will sell the pass. We arrived in the Giant Forest area in the afternoon, so we arranged to stay a night in Wuksachi Lodge. We wanted to leave early the next morning to make the 11-mile hike along the High Sierra Trail to Bearpaw, so Wuksachi worked out perfect. The overnight stay helps get acclimated to the elevation before we started the long hike. 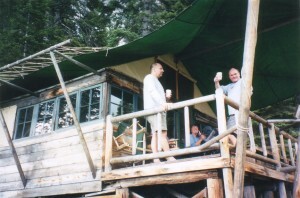 We got up early the next morning, had breakfast in the lodge, and drove down to Crescent Meadows to start our hike. The Bearpaw Meadows staff informed us the hike can take from 6 to 11 hours to complete, but most make it in about 7 hours. Of course, the more able bodied can make the hike in less time. In fact, one staff member told us he made the hike in 3 hours, which sounded amazing to us, but we had to keep in mind that they hike the trail very often and they do not need to carry any significant weight. However, you do not need to carry very much, since the camp will supply food and lodging. The camp will have tent cabins with two small cots and basic linens, but an additional person can be added, sleeping on the floor for an additional fee. There were only 3 of us making the trip so we squeezed into one cabin comfortably.The third person has to bring their own sleeping bag or beddings, though the staff was very accommodating and gave us an additional sleeping bag to pad the floor a bit. Since the hike is 11.3 miles, make sure you have plenty of water and some food for lunch or a snack. I carried several liters of water with me, but I like to drink lots of water along the way. Just keep in mind there will not be any place along the way to replenish your water supply until you get to the camp. There are a few creeks you will pass along the way which were very inviting to splash your face to cool off. If the sun is out, it will be hot, but there are some shaded areas along the way to make a rest stop. 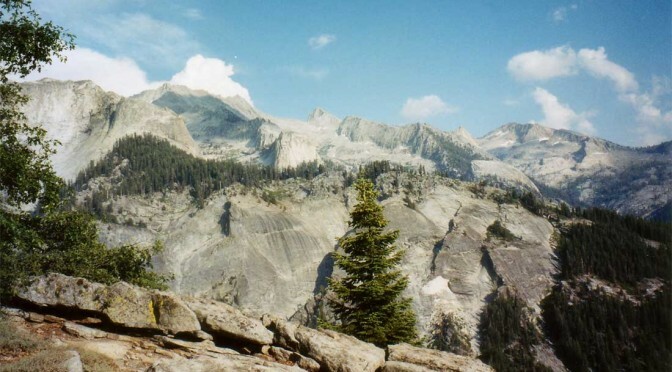 Take a good camera because the views along the trail of the Great Western Divide are spectacular. The hike is not technically difficult, but the distance of the hike can still be very tiring. Good hiking shoes or boots are a must. The trail is well established and easy to follow and does not change in elevation much, only about a 1,000 foot overall increase ranging from 6,800 to 7,800 feet, so there aren’t very many switchbacks to contend with. However, the last mile or so there will be a steep elevation climb, saving the “best” for last, when you are nice and tired. We arrived in the camp about an hour before dinner; so we had time clean up and rest a bit before we sat down to eat. The food was excellent here. The staff really takes pride in their cooking and you can really taste it. Three meals a day were prepared, but if you were going out hiking during the day, you could ask the cook to prepare a sack lunch for you. Not having to worry about cooking and clean up was a very nice feature. The camp will have shared shower facilities, and an outhouse. There is a sitting area attached to the kitchen where meals are eaten, with a beautiful view of River Valley and Redwood Meadow Grove in the distance below. They have a book exchange and some board games handy to help pass the time if you desire. Also, they had a few supplies such as batteries, film, suntan lotion and other small needs for sale, but I’m sure what they have available at anytime will vary so plan wisely. Everything was on the honor system and you settled your bill when your stay was over. We stayed 2 nights, but you can book as many as you wish. Our first full day in Bearpaw, we decided to take a hike up to Hamilton Lake.The trail gains about 1,000 feet and there are some switchbacks to follow. We were able to get to the lake in about 2 hours. The area up there was gorgeous and jumping into the lake was a real treat. It is an alpine lake so the water is very cold, but after a heated hike, the water was too inviting to ignore. We spent the next couple of hours sunning ourselves on the rocks beside the lake and eating our lunch before following the trail back to the Bearpaw camp. After breakfast the next morning, we had to do the 11-mile hike back to Crescent Meadows. This time our hike was much faster, we were able to get back to the trail head parking area in 6 hours. However, it seemed to be a more tiring hike, and my feet were really barking when we made it back to the car. I think we could have paced ourselves a little slower on our hike back, and still be able to return at a reasonable hour. On the way out, we stopped at the Lodgepole visitor center and used the showers to freshen up, and boy, did that feel good. I would definitely like to go back to Bearpaw Meadows Camp. It was a long hike in and out, but once you are there, it’s just so amazingly beautiful. I think I would stay an extra night or two, as well. There were many other trails to explore, so one could stay there probably a week and see something new everyday. The place was so isolated and comfortable; you deserve to really enjoy it leisurely, you earned it.